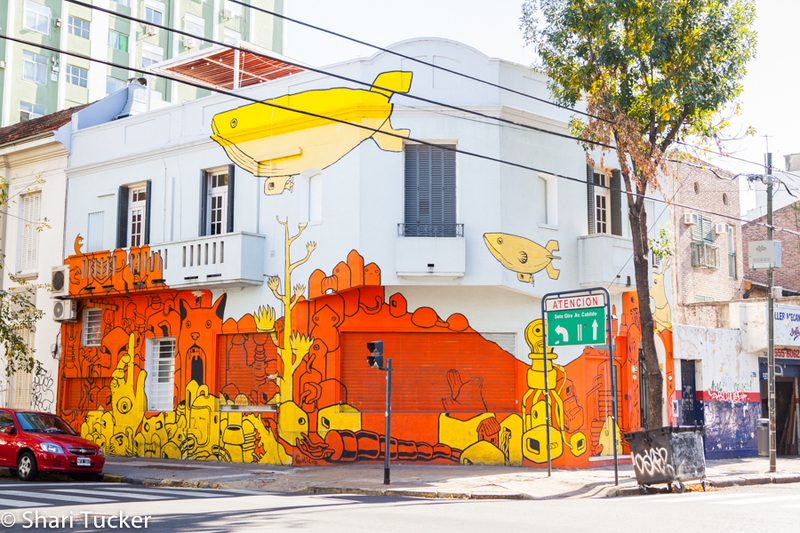 Big cities around the world often have underground Graffiti and Street Art scenes, Buenos Aires is no different … or is it? As part of this country’s deeply carved wounds in the political past, the graffiti and street art of today are a representation of the struggles, a reminder of the battles, a voice speaking out to create a movement. From the outside looking in, the general public (at least where I’m from) view Street Art and graffiti as the enemy. It’s old. It’s ugly. It defaces and devalues property. It’s a hassle. It’s got to go. Rebellious kids are responsible for destroying property. Poor people and the uneducated are the cause. In fact, this is exactly why there is a misconception of this form of art. It has been misunderstood by so many for so long. I’m here to challenge your perceptions. Let me start with a very simple difference between Street Art and Graffiti as they are not the same. Graffiti was where it all began. Various forms of painting large, blocky letters in public spaces. This was often done anonymously. Sometimes it would be legible to the average passerby, but often it was a language only understood by other graffiti artists. Street art has nothing to do with letters and words, but everything to do with art, beauty and conceptual messages. Again, some may be obvious to a passersby, or it may be understood only within the artist community. Some displays are just for the beauty of it, with little conceptual meaning other than to give the viewer enjoyment. Indeed, graffiti and street art in almost every city that has risen out of poor governments in power, loss of control or war. It is true, that in the beginning that those who went to the streets did so in the dark, illegally and in a hurry to avoid being arrested. They were driven by their passion for a cause, their audacity to stand against a dictatorship and to draw likeminded people together. They were the silent, but visual leaders of their time. Their art became a language to be shared and to unite them. They were not hitting the streets to destroy random property or to make their city ‘ugly’. They were going to the streets like men who go to war. They were fighting a battle of words against their flailing governments and building support without the aid of government funded media. Graffiti in general started out as anti-government, or at least against specific government parties. It was a semi-permanent protest that could be spread across city walls by night and visible by day. It was a voice for those who were being silenced. It’s a pretty dark history, but as with anything from the past, people learn and grow from it. Governments change, wars begin and end, cities make laws and then change them. 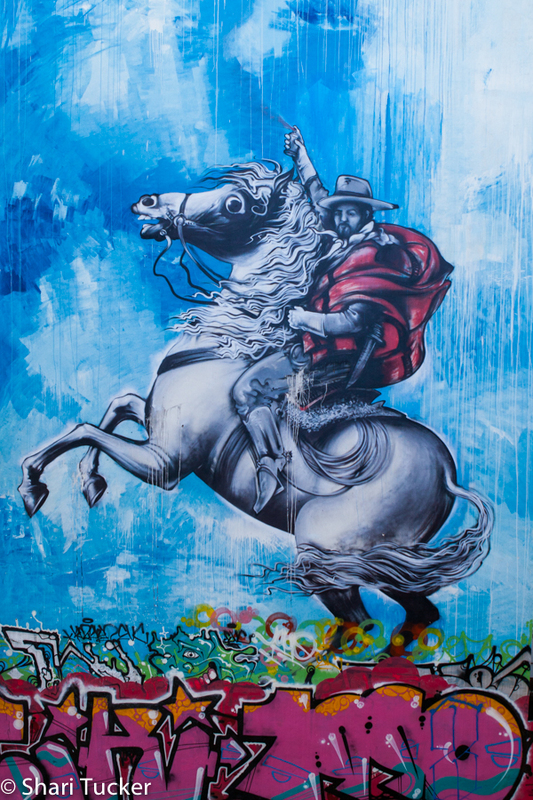 On my recent Street Art tour with Graffiti Mundo in Buenos Aires, I really began to understand more about the recent history of the art and how it flourished from the ugly past. In the early 2000’s, the city went grey. Devoid of colour, devoid of hope. Huge billboards and public wall space was devoted to campaigning for government. Political propaganda was everywhere. Sky-high faces of leaders painted on previously blank spaces appeared. Citizens were being silenced and the dictatorship was quashing any resistance. Artists started having secret gatherings in garages and clubs to discuss what they could do. They had no money, the government was forceful, and they were just a few people. What they decided was that they needed to put colour back into their streets. They needed to spread hope rather than disparity. They needed to move forward instead of being stuck. Artists began by painting the outside of their own homes and offices, making their own colourful art. The artists had no money, so they collected paint left overs from the street and started getting creative with mixing colours as well as trying new methods. Spray paint is expensive to buy, although quick to use, so it was often the choice of Graffiti artists. Latex paint is free, if left over from someone painting their house, but takes longer to design with. This meant that you could not paint and run. People took to painting their own spaces, in broad daylight with whatever materials they could find. Painting, for the purpose of putting colour back in the streets; for doing something rather than nothing. This art also led to less space for political propaganda. It was a protective layer for their houses as propaganda messages from the government would easily be lost if they were painted on top of colourful art instead of on a clear blank wall. The Artists thought that if everything else in their city was grey, boring and politically fuelled, that if they painted colourful art, with no political affiliation, it would stand out. It would disrupt the norm because it was different. And, so it continued to flourish. A group of 12 artists collaborated on this wall below. Soon enough, a few people painting one or two of their homes were asked by neighbours what they could do. The grand answer – Paint! Find paint and paint the grey away (or the politics away, depending how you read into it). Neighbours joined in by painting their own homes, or by offering up large blank building surfaces to be painted with full artist discretion. The camaraderie, the appreciation of art and the common passion for revitalizing the city was thriving. No longer did artists have to buy spray paint, tip toe around after midnight and rush to pain their message on a wall before being caught. No longer was it a taboo. The city opened up and embraced the art with many businesses now commissioning artists to paint their walls. Sometimes these are paid gigs, other times artists do it simply for the joy of painting and sharing their vision. Still today there is a law in Argentina that says you have the right to paint your house however you wish. Neighbours don’t complain about it being an eye-sore, if you own it, you can paint it. 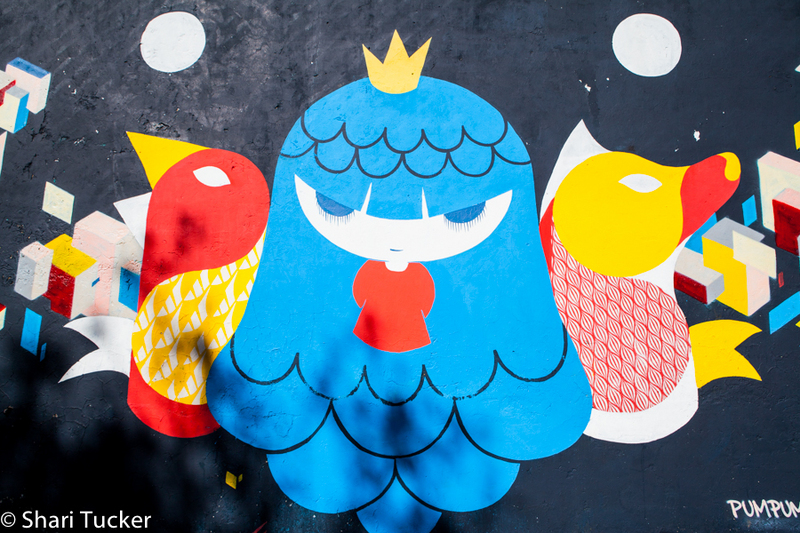 A few years ago, Buenos Aires even hosted a large scale festival dedicated to painting the city. Well-known graffiti and street artists came from around the world (by invitation or by choice) to participate. Being a government run project, sadly, the festival rubbed many artists the wrong way as the funds coming in from the festival all went back to the government (to their consulting and construction fees) while none of the money went back to support the artists. The festival was held mainly in an area of the city near Palermo Hollywood, but known for social housing, the city dump and a main bus hub. Not the prettiest or most desirable of neighbourhoods. Hundreds of artists joined the festival and painted a piece of themselves on the walls, brightening up this otherwise monotonous neighbourhood. Over the years, street art studios have opened and closed. Sadly, most of them are now closed. It has been a losing battle as the government prohibits artists from exporting their art to an international market. This means their art has to be purchased by other Argentinian’s, who for the most part are in the same constant struggle to get buy with the little money they have. They don’t have money to buy art, leading to the closing of many of the galleries and lack of exposure and recognition for deserving Argentinian artists. Even today, as European and first world as Argentina appears to the outside world, it’s internal struggles are tormenting it’s people every day. They are stuck in a hamster wheel where they can’t get off. Their money is monitored, their currency has no value and citizens are not allowed to earn or spend USD. 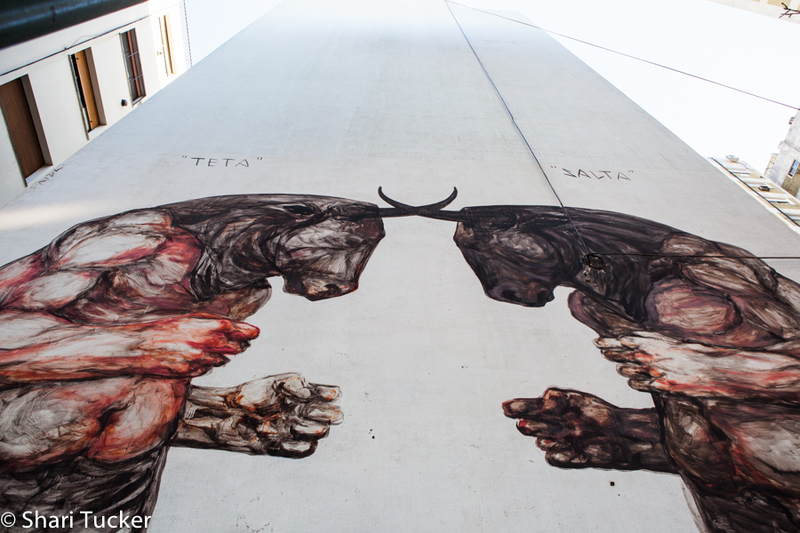 In the year 2015, Argentina is still in political turmoil, but the vision and artistic passion of it’s people lives on through the streets. No matter where you look, you can see walls popping with colour, you can see images of conflict amongst images of roses. You can even find an entire street block filled with Homer Simpson’s face as an effort to be the world’s largest wall of Homer Simpson. The spirit of these artists is friendly, open and without shame for the work that they do. Although their government stings them with restrictions that are unbearable for many of us to consider, they march on spreading their vision throughout the city. These are not the poor, uneducated criminals that the media would have us believe. These are talented, educated, intelligent leaders who believe in a better Buenos Aires, a better Argentina. Their voice runs through the streets and colourfully joins neighbours and strangers together against the government’s disparity.